In an era when smartphones automatically back up to the cloud, flight recorders don’t transmit data & need to be physically hauled from the deep. Once again, the world is transfixed with an undersea search to solve the mystery of why an airliner plunged into the ocean. With images of the years-long unsuccessful search for Malaysia Airlines Flight 370 still fresh, the Indonesian government has dispatched 34 boats and more than 800 military and civilian personnel in search of a Lion Air plane that went down violently on Monday with 189 people on board, all of whom are feared dead. Divers hadn’t located the aircraft’s underwater resting place as of Tuesday night. The search in relatively shallow water near shore with data showing a precise location of the crash shouldn’t present the difficulties faced by some previous hunts, but veterans of these efforts cautioned that it could be complicated by balky locater beacons and the sometimes tricky politics of who has to pay the considerable sums required to locate and retrieve wreckage. Based on what appears to be a high-speed dive into the water, which can violently tear an aircraft apart, it’s possible the so-called pinger locater beacons attached to a plane’s crash-proof recorders were damaged, said Steven Saint Amour, who is founder of Eclipse Group Inc. and has participated in dozens of similar searches. The pingers send a sound beacon once they come in contact with water and are designed to make them easier to locate. If the pingers broke loose on the Lion Air plane, then a lengthier manual search would be required to find the black box recorders, he said. 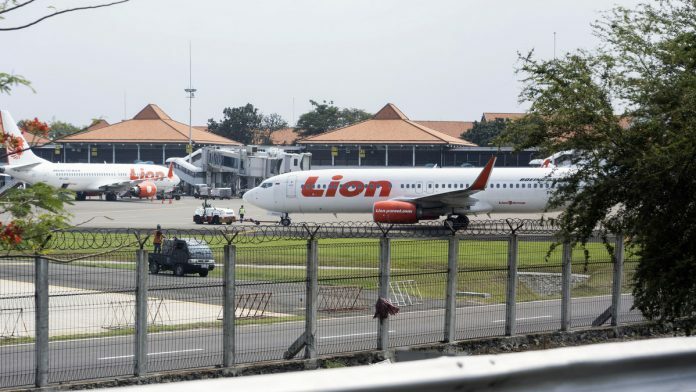 The almost new Boeing Co. 737 Max crashed a few minutes after takeoff from Jakarta early Monday, slamming into the water at high speed, according to preliminary data transmitted from the aircraft to the ground and reported by FlightRadar24. A pilot had asked to return to land and the flight track showed variations of speed and altitude, suggesting they were dealing with some kind of problem. But the plane’s black boxes — which monitor its electronics and mechanical systems as well as record the words of the pilots — are needed to unravel what led to the dive into the water from about 4,850 feet (1,479 meters) altitude in about 21 seconds. Even in an era when smartphones automatically back up to the cloud, flight recorders don’t transmit their data and need to be physically hauled from the deep. While it may be possible someday to stream flight data via satellite networks in real time, such networks don’t currently exist to accommodate the thousands of aircraft aloft at the same time. After the Malaysian jet disappeared in 2014 and following the almost two years it took to locate Air France Flight 447 in the Atlantic Ocean after it crashed in 2009, aviation regulators around the world implemented several steps to make it easier to find planes that crash in the oceans. They include making pingers that last for 90 days starting in 2020 instead of the current 30-day requirement. However, there still isn’t an easy way to access the Lion Air jet’s data without getting the actual black boxes. The seabed in that region of the Java Sea is thought to be relatively flat, though mired in layers of sediment — unlike the undersea mountains and canyons that have hampered teams searching for a missing Malaysian airliner in the southern Indian Ocean. “The shallow water of the Lion’s crash could lead to some or many of the parts to be buried under the seabed or got covered in thick sediments,” said Shadrach Nababan, a former investigator at Indonesia’s National Transportation Safety Committee. Even in cases where the wreckage is easily located it can take days or longer to locate the black boxes. Specialized underwater microphones are required to hear the pingers, which transmit on a frequency outside the range of human hearing.